Tablets running Chrome OS are actually a thing now, as the Chromebook Tab 10 shows us. While that device is mostly aimed at education, it's only a matter of time before companies offer similar devices for business and personal use too. Since Chrome OS can run Android apps now, some people expect it to replace Android on tablets in the future. I'm not yet sold on that concept -- I still prefer Android running Chrome rather than Chrome running Android, but I'll keep an open mind. The biggest problem with Chrome OS tablets -- especially for education -- is the lack of a physical keyboard. The Chromebook Tab 10, for instance, is just a tablet -- it does not come with a detachable keyboard. 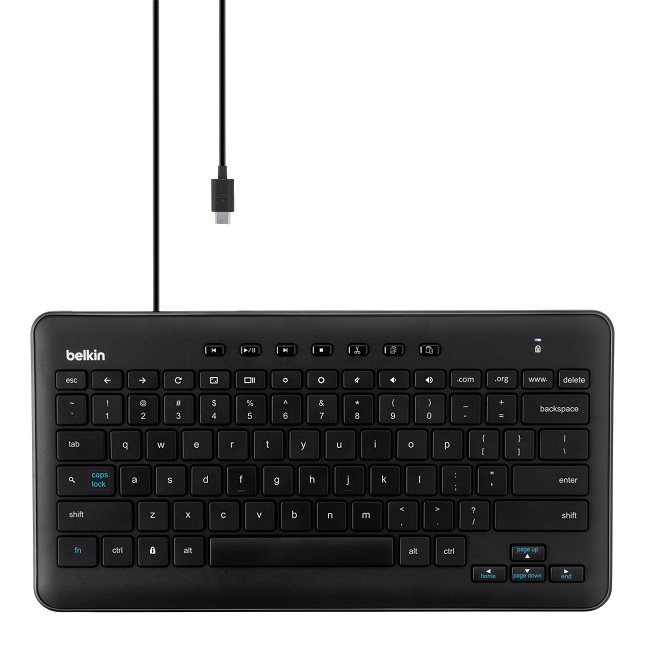 Well, Belkin aims to solve this with the all-new Wired Tablet Keyboard with Stand. As the name implies, it is a USB-C keyboard that props up the tablet for a laptop-like typing experience. In addition, the company unveils a similar keyboard without the stand. 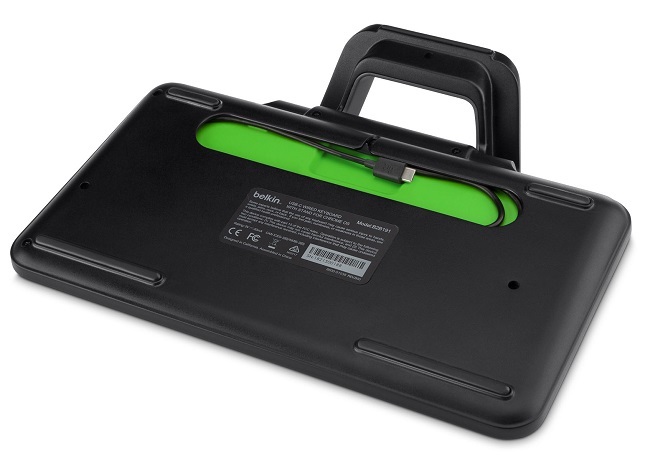 That product will work with tablets too, although it is probably better suited for a USB-C enabled Chromebook (when connected to a monitor as a desktop), Chromebase, or Chromebox. "The Wired Tablet Keyboard with Stand for Chrome OS (USB-C Connector) additionally features an integrated stand which holds the tablet in portrait or landscape mode and works with virtually any case. A cable management compartment on the back of the keyboard ensures that cables stay safely and neatly tucked away. 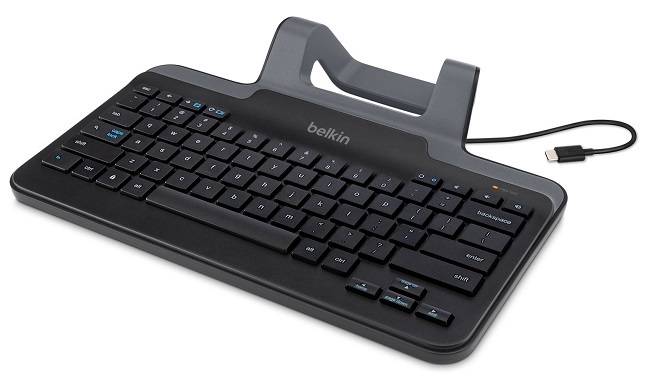 These keyboards stack for easy storage and distribution," says Belkin. Jon Roepke, director of product management, explains, "Belkin Education is dedicated to developing the best solutions for digital learning environments through hands-on research and spending time in classrooms. 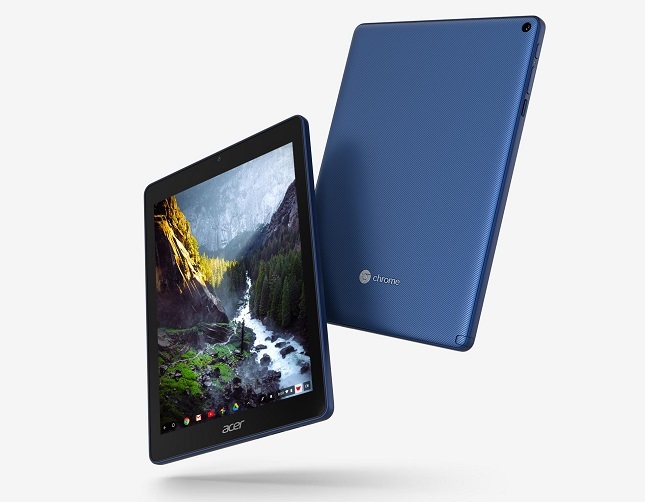 From our many discussions with educators, we identified a need for a reliable solution for Chromebook Tab users as integration of Chrome OS tablets in the learning environment increases. These new keyboards will help bridge the gap between education technology and actual implementation in the modern classroom." Belkin shares the following notable features of these keyboards. While these keyboards will probably work with other operating systems such as Windows, macOS, or Ubuntu, they certainly aren't optimized for them. For instance, they are lacking certain keys, such as the Windows/Super key. Ultimately, only Chrome OS users should buy them. Some folks may wonder why schools can't just buy Bluetooth keyboards for these tablets. For one, that would be just another thing to charge -- a major headache for teachers, students, and administrators. These USB-C keyboards are bus-powered, meaning they don't require a separate energy source, such as a battery or AC adapter. Also, Bluetooth connections can be unreliable -- even more so when hundreds of kids are using them all at once in a school. There could be interference issues. When exactly these keyboards will become available is a bit of a mystery. Belkin only says "summer 2018," but as of last week, we are already in that season. In other words, availability could be imminent or months away. Either way, since they are designed primarily for education, that shouldn't be an issue as kids are currently on vacation from learning. Pricing is fairly reasonable, although I think Belkin could drop the price on each by about $10. The Belkin Wired Tablet Keyboard with Stand for Chrome OS is $49.99, while the non-stand variant is $39.99. With that said, there may be discounts for schools or districts when buying in bulk. Administrators would be wise to reach out to Belkin to see if special pricing could be possible.